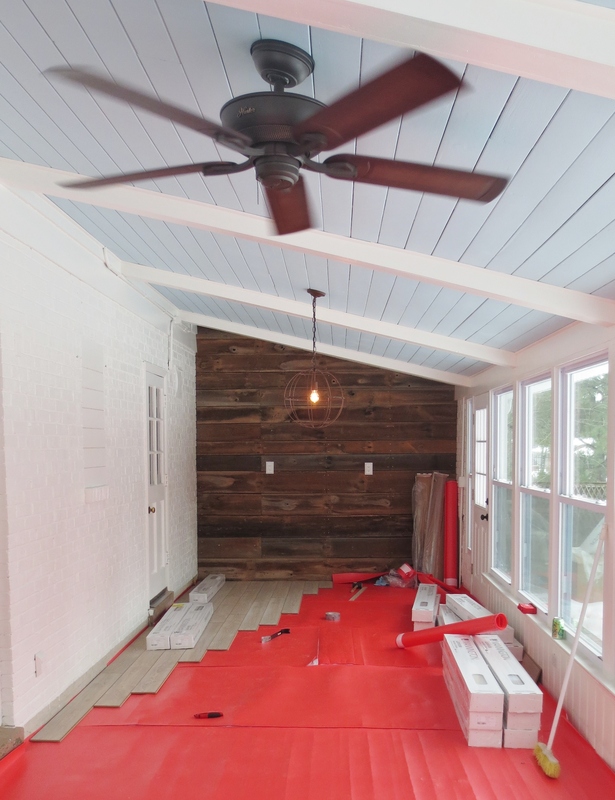 The floor in the sun room has been installed. Behold! File this job under easy but not super fast. It took Mark a good 8 hours over 2 days to complete the installation. I helped with the underlayment and our neighbor helped with the laminate. The process is pretty straightforward. Here are the basics. 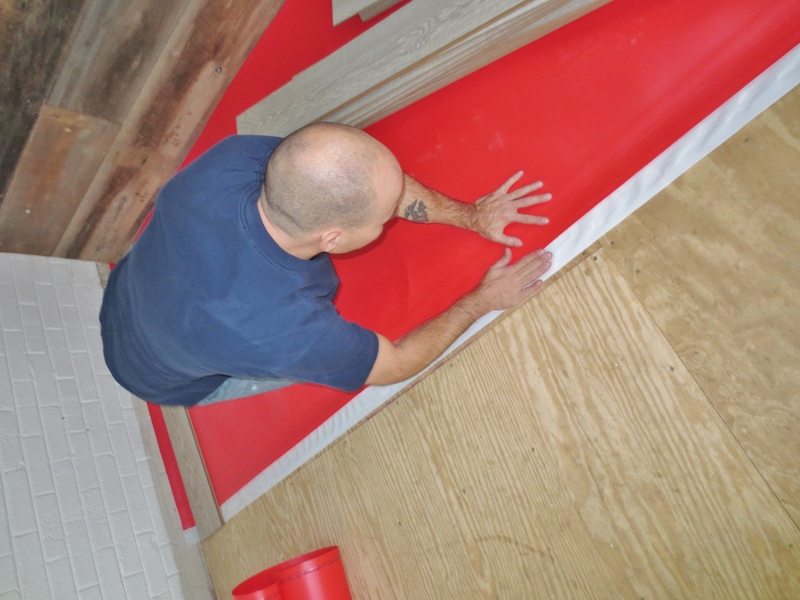 Since we had already installed baseboards, we had to pull those up before we started. We installed the baseboards back in September when we thought we were going to paint the subfloor so it kinda sucked to have to do this step twice, but it’s part of the journey. We selected this underlayment by FloorMuffler. It is 2mm thick and helps to both insulate and reduce noise. 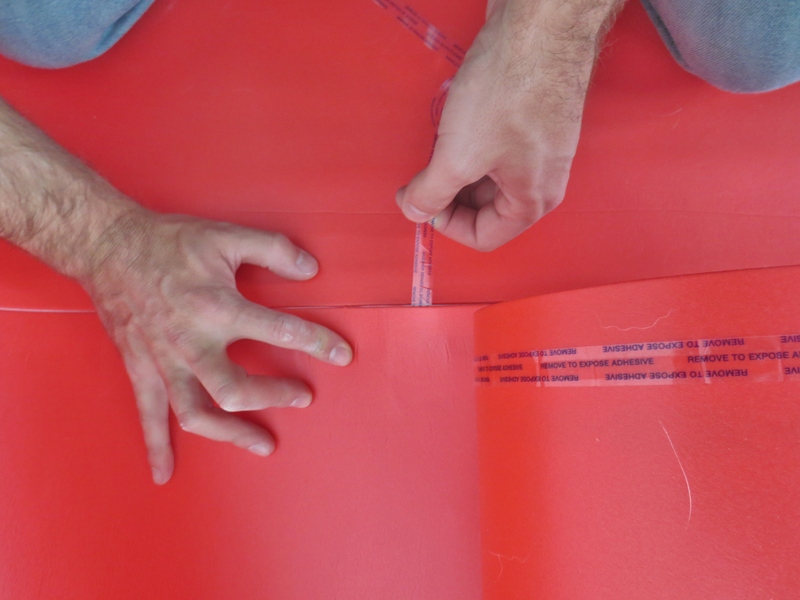 It comes in a roll that you stretch out over your floor and cut to the proper length. See the white edge? That is actually thin plastic that you peel back from the underlayment. This is so the sheets can be attached right next to each other like so. 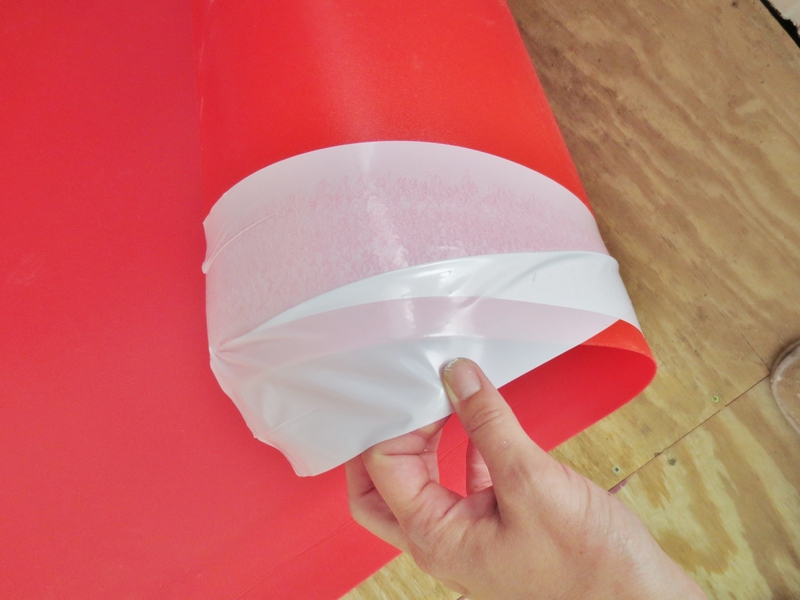 As you can see, you attach the next sheet to the white plastic of the previous one by removing the covering over the strip of adhesive. It is a pretty easy process, but it does help to have two sets of hands to help keep things smooth. After the underlayment was in place, it was time to start laying the floor. The thing to consider before starting to set the boards is pattern, or for us, a lack thereof. We felt that the floor would look best if it did not have a repeating pattern, but rather if the boards were random lengths. 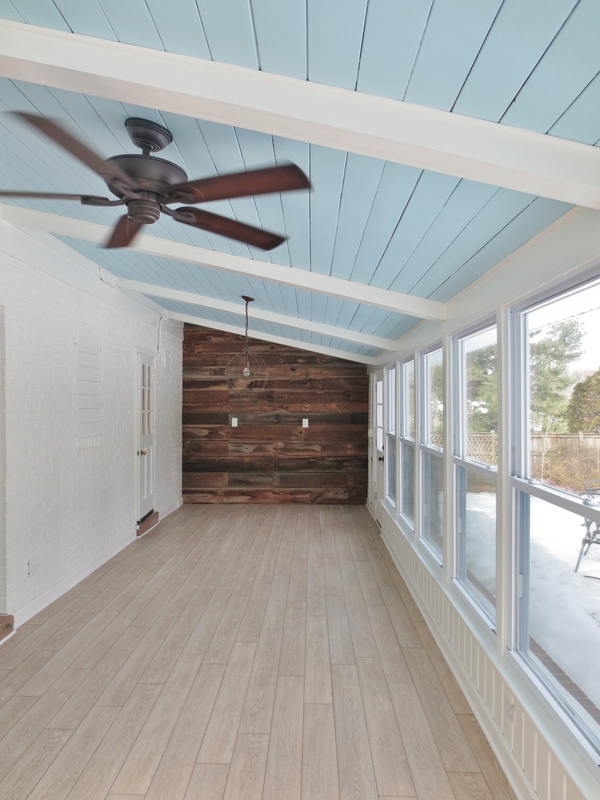 To accomplish this, Mark first laid a full length board along the wall that connects the sun room to the kitchen right up against the barn board. From there he cut five boards at random lengths and attached them one to the other moving away from the house towards the back yard. Then he went back to the kitchen wall and started adding full-size boards out into the room off of each of the five cut boards. This created a random pattern across the room. Once he added 1-2 boards to each of the first five rows, he went back to the barn board wall and added one full-size board and then five randomly cut boards to keep the non-pattern pattern going. Rinse and repeat until the whole room is done. 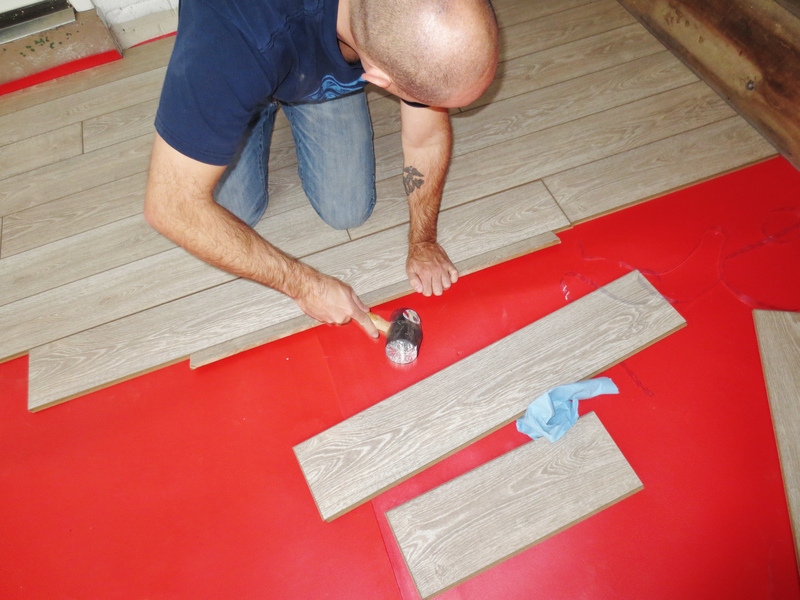 To lock and set the boards into place, Mark used a cut piece of laminate and a rubber mallet to knock the boards tightly together. 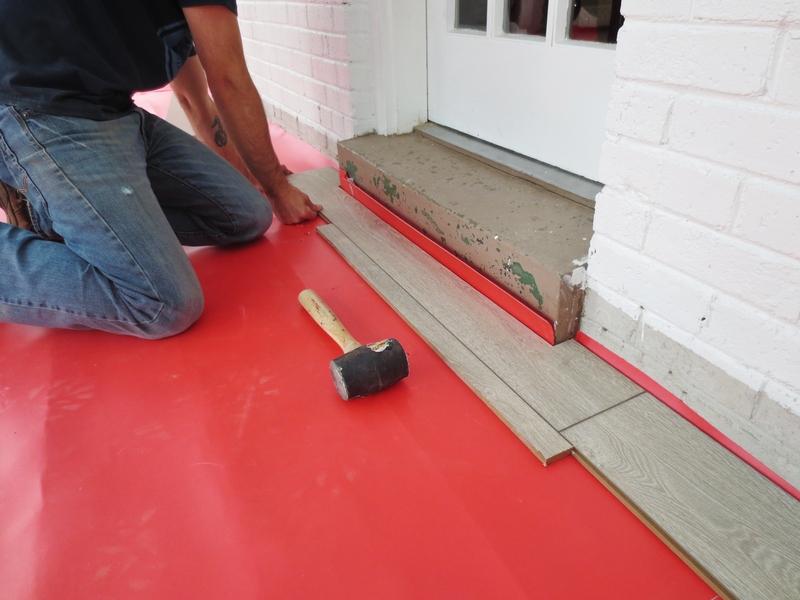 Around the steps, Mark cut the laminate to fit using his circular saw and multi-tool. 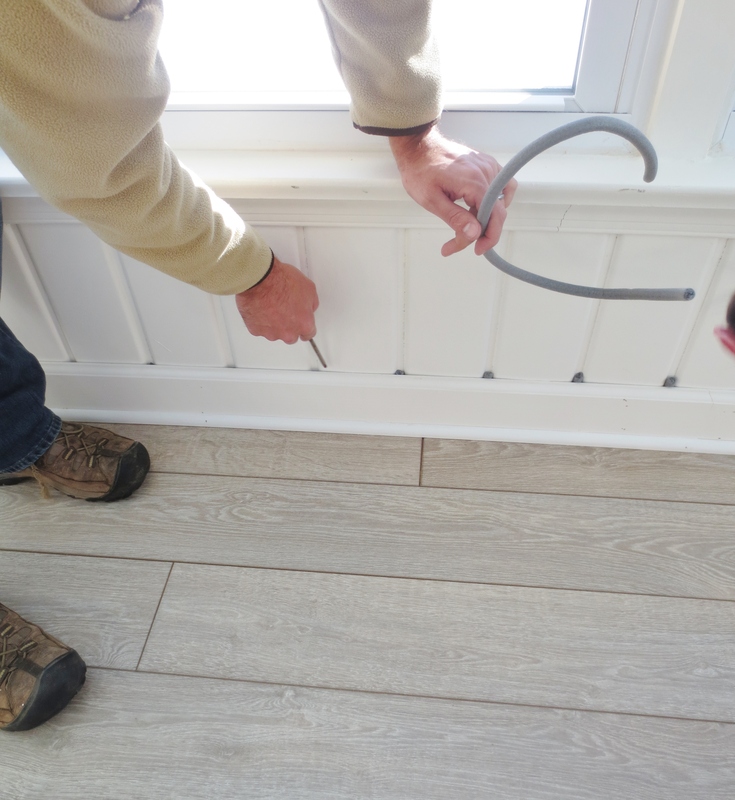 Once the laminate was all in place, Mark put back the baseboards and even plugged the grooves of the wall under the windows with small bits of insulation to help keep the cold air out. Now all that was left to do was move the furniture back in and enjoy! Obviously we still need things like rugs and a few more pieces of furniture in the sitting area (not to mention doing something about those mismatched chairs!) but we had dinner out there with friends on Sunday night and it was awesome! We are so relieved to be done with the floor and super happy with our choice. 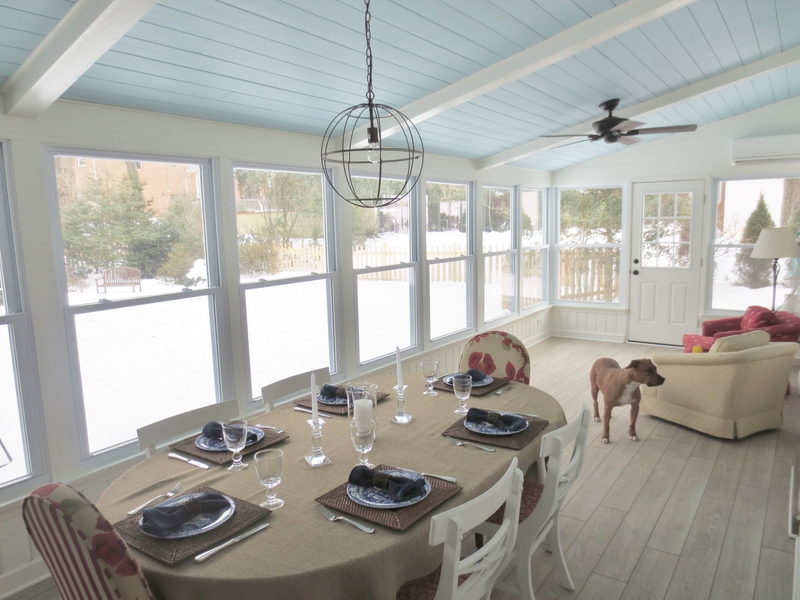 We think it looks terrific and should be both durable and low-maintenance. The next step will be painting the steps from the house, installing curtains and rods, and getting the chairs reupholstered. While we do these smaller projects we are also starting to think about the bar area. We are in the home stretch of this monster project and are itching to reach the finish line. I hope you’ll stay with us and cheer us on! I’m the editorial assistant for HouseLogic.com, a site published by the National Association of Realtors covering homeownership-related topics. Would you be interested in granting us permission to feature a photo from your flooring project in a slideshow about wood look alikes? Email me at libby@houselogic.com for the details. Thanks! Hi again! Just checking in to see if you were interested in allowing HouseLogic to feature your DIY project. Email me at libby@houselogic.com and I can send you the details! Libby, I just sent you an email! Hi Angela. Yes, this is the antiqued finish of the Manningham Black Forest Oak and I do think it’s nice and neutral and would work well in a larger space. Good luck with your reno!